What is CryoPen™ Skin Lesion Removal? 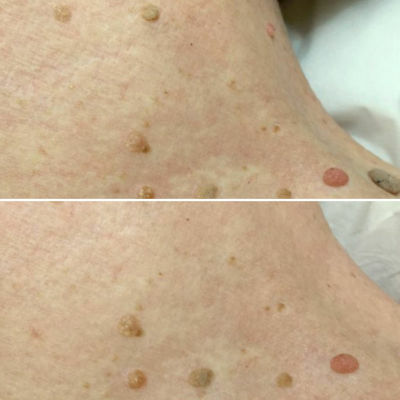 CryoPen™ is an innovation in Cryotherapy allowing benign skin lesions such as Skin Tags, Milia, Cherry Angiomas, Age Spots, Warts and Verrucas to be treated quickly and painlessly. Not to be confused with traditional Cryotherapy, CryoPen™ is the most innovative hand held treatment system using advanced compression cooling technology. With its applicator pen, it enables accurate, pen-point precision minimising damage to surrounding tissue, and delivers a consistent freeze temperature to maximise efficacy. CryoPen™ delivers precise cooling, without the need for any cryogenic gases, liquids or anaesthetics, making treatment virtually painless, quick, effective, and safe enough to use on children. It is an ideal solution for removal of skin lesions and imperfections with treatments usually taking just 5 to 25 seconds per lesion. What can CryoPen™ be used to treat? 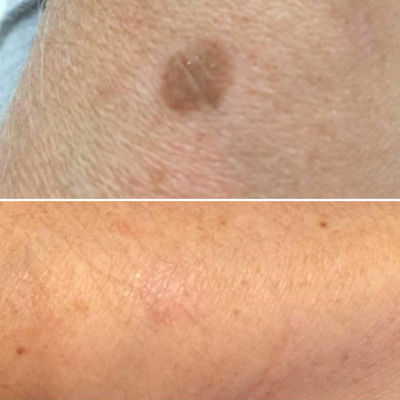 Many different superficial skin lesions can be treated with CryoPen™ including viral warts, skin tags, seborrhoeic keratosis, actinic keratosis and other benign lesions. It is essential that a correct diagnosis is made before treatment as we are only able to treat benign lesions. If a lesion looks suspicious, you will be advised to seek approval from your General Practitioner to proceed with the treatment. Treatment can take place on the face, scalp or body depending on the type of skin lesion. It is possible to treat several areas in a single session. The CryoPen™ emits a pressurised, super fine jet of nitrous oxide from its tip, which allows our clinician to work with precision that is millimetre perfect. The tissue is destroyed by freezing the inter-cellular fluid, forming ice crystals which break the cell membrane, thereby destroying the targeted tissue; allowing healthy tissue to remain untouched. Is Cryotherapy with CryoPen™ safe? The safety of Cryotherapy has long been established and the risk of complications when using CryoPen™ is lower than many other treatments and methods. Cryopen™ delivers N2O directly to the area, and not the healthy surrounding tissue. Cryopen™ is both CE and FDA approved. At Sheer Laser Clinic, Cryopen™ treatments are only ever delivered by one of our highly trained Cosmetic Nurses or Aesthetic Practitioners, as we believe it is only safe to be administered by someone who is adequately trained. What can I expect during my Cryopen™ treatment? At Sheer Laser Clinic, every client’s needs are unique, therefore each client receives a bespoke consultation. During the consultation you will be required to discuss your medical history as well as the lesions. The practitioner will then discuss the treatment options available to you and the expected outcomes. When a suitable treatment has been agreed upon, the treatment can then be administered. If a lesion looks suspicious, you will be advised to seek approval from your General Practitioner to proceed with the treatment. When administering treatment, your practitioner will target the lesions with the Cryopen™. The duration of the treatment is dependent on the size and nature of the lesion, but generally each lesion just takes a matter of seconds. It is usual to see a frost or ice-field appear on the top of the lesion during treatment. A ‘freeze-thaw-freeze’ approach is often used when the lesion is frozen, allowed to defrost for a few seconds and then a second treatment applied. Although it is best to try to leave the treated area uncovered, a plaster or simple dressing may be applied if it is in an area which may lead to rubbing and aggravation. No anaesthetic is required for Cryopen™ treatment. It is usually very well tolerated with only minimal discomfort. The sensation is similar to a stinging nettle on the skin when the nitrous oxide reaches the bottom of the lesion, but this vanishes quickly. There is sometimes some residual stinging after treatment which may last for several minutes. Following the treatment, the skin lesion may become red and sore, and there may be some blistering and occasionally a scab may form. If a deeper freeze is required, this can sometimes cause a greater degree of pain which may be immediately following treatment and for a variable time afterwards. This is not to be confused with traditional Cryotherapy, which can be very painful as it usually hits healthy tissue. Healing occurs anywhere from 1-6 weeks following treatment, depending on depth and size of the lesion. Lesions usually assume a darker colour (this is the dead cells), as the skin regenerates underneath it will slough or flake away. A follow up visit is recommended after 4 weeks to assess response to the initial treatment and whether further application is required. What do I need to do after my Cryopen™ treatment? You will be given clear aftercare instructions when you undergo Cryopen™ treatment at the Clinic. With Cryopen™ there is no real downtime; often clients book to have this treatment in their lunch break and return straight back to work. We do not recommend covering the area with a dressing or plaster unless we have otherwise advised you to do so. Healing will tend to occur over a 1 to 6 week period. If you have any concerns that the wound may look infected (increasing redness or pain, yellow discharge or puss) then we would ask you to book an appointment with us for a review at the earliest opportunity. Over the following days, a scab will often form and the lesion may become a little red and angry looking. 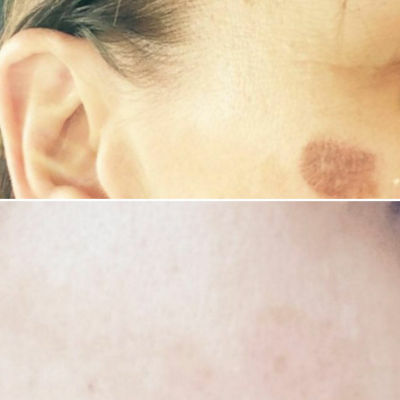 This will usually resolve over 1-6 weeks and the area remaining will often return to normal, although it is possible to develop a small area of scarring or change in skin colour. It is important not to pick at the scab as this may lead to scarring. We offer a four-week review appointment to ensure that the desired result has been achieved. At this follow-up appointment, an additional top up can be administered if deemed necessary. Following treatment, it is normal to experience a residual stinging which can last for up to an hour. After this, the area will often become a little red, swollen and sore and a blister may develop. There may be some weeping from the wound and a scab may develop. It is important not to pick at the wound as this may result in scarring. As the wound heals, the skin lesion will dry up, assume a darker colour and slough off in 1 to 2 weeks. It is very important not to pick at the area as this will increase healing time. Lesions treated on the legs often take a little more time to heal. A follow up appointment will be made and further treatment applied if necessary. The results of CryoPen™ treatment are permanent, however it can take more than one application to remove the lesion. A follow up visit is recommended after 2-4 weeks to assess response to the initial treatment and whether further application is required. What are the possible side effects of CryoPen™ treatment? 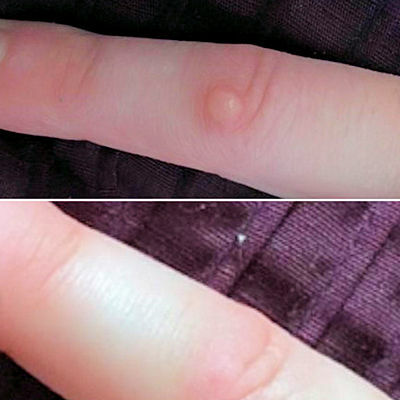 CryoPen™ treatment is non-invasive and relatively low risk. During the healing process, the treated area may develop some pigment change, either darker (hyper-pigmentation) or lighter (hypo-pigmentation). This colour loss may take longer to return in darker pigmented skin. This will generally improve over a period of a few months but sometimes may persist indefinitely. If pigment change occurs, we recommend you book a review appointment with us so that we can advise you accordingly. Freezing can cause some irritation to some of the small nerves in the skin and lead to an area of numbness, tingling or hypersensitivity. These symptoms will generally improve over a period of weeks or months. Is CryoPen™ treatment right for me? Before undergoing CryoPen™ treatment for the first time, clients often have many questions and concerns. 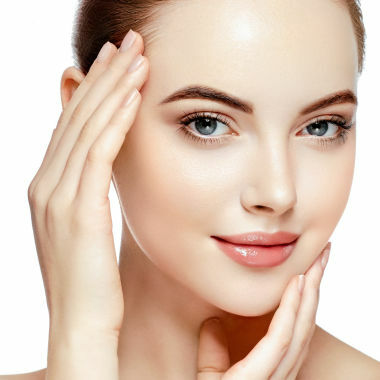 Being well informed about every aspect of your skin lesion removal procedure can help ensure that you are satisfied with the outcome of your treatment. This will be done during your non-obligatory free consultation. You will be advised about what the treatment involves and an assessment done to ascertain your suitability for treatment. We may advise you against treatment if we feel this to be in your best interest. At all times, we ensure that you receive an honest assessment that puts your needs first. Who should not have treatment with CryoPen™? CryoPen™ treatment is not suitable for women who are pregnant or breastfeeding and those with auto-immune disorders or cold sensitivity are not suitable for treatment. It is also not suitable for those that suffer from keloid scarring. Is this treatment available with the NHS? Removal of skin tags, millia and cherry angiomas is no longer treatable as a standard NHS procedure as it is considered a cosmetic procedure. 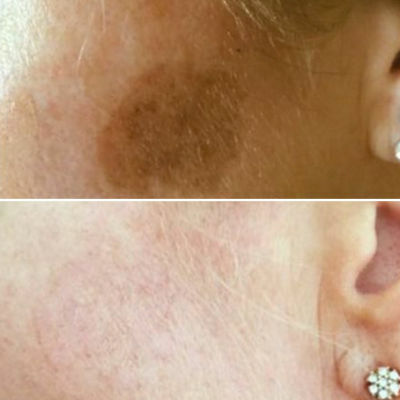 With the CryoPen™ you can now have this treatment at Sheer Laser Clinic. Can I have CryoPen™ treatment if I have darker skin? Repeated short freezing cycles will be recommended if you have a darker skin type. This just means that you may need more sessions spaced a few weeks apart to remove your lesion rather than just one. Can children be treated with CryoPen™? Yes, because of the reduced discomfort, we are often able to treat younger patients without distress. You will be asked to fill in a parental consent form before your child’s treatment.